Explanation: Dusty NGC 1333 is seen in visible light as a reflection nebula, dominated by bluish hues characteristic of starlight reflected by dust. But at longer infrared wavelengths, the interstellar dust itself glows. Moving your cursor over the picture will match up a visible light view with a false-color infrared image of the region from the Spitzer Space Telescope. The penetrating infrared view unmasks youthful stars that are otherwise obscured by the dusty clouds that formed them. Also revealed are greenish streaks and splotches that seem to litter the region. The structures trace the glow of cosmic jets blasting away from emerging young stellar objects and plowing into the cold cloud material. In all, the chaotic environment likely resembles one in which our own Sun formed over 4.5 billion years ago. 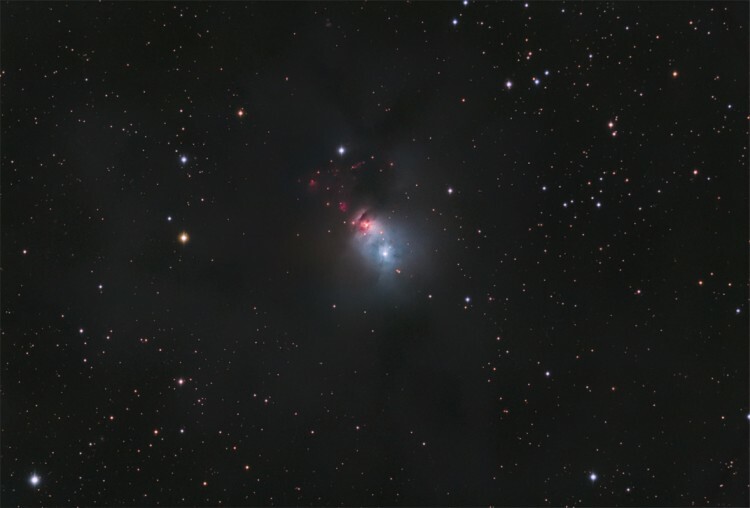 NGC 1333 is a mere 1,000 light-years distant in the constellation Perseus.